Most modern cat foods can be associated with the build up of plaque and tartar on cats teeth. This is even true of many dried kibble or biscuit diets. (When the tooth applies pressure to a hard biscuit, the biscuit can shatter, producing crumbs which mix with saliva and leave a coating of food debris on the teeth.) Hill's Prescription t/d is different due to a meshwork of tiny fibres which are formed throughout the kibble. The kibble itself is less brittle so that the tooth will sink into it before splitting, so mechanically cleaning the sides of the tooth in a way which cannot happen with many traditional hard kibbles. 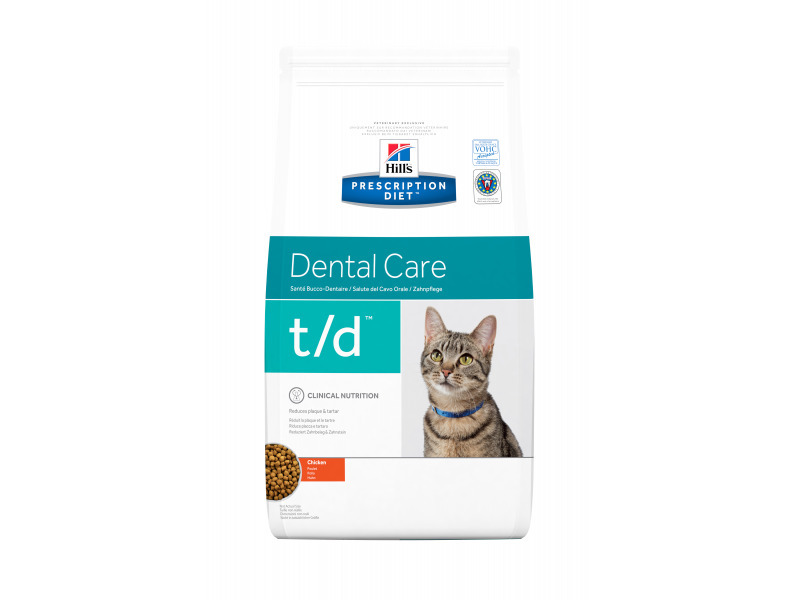 Hill's t/d might well be the best commercial diet available for keeping cats teeth clean and the mouth healthy. Protein Controlled Helps limit a component of plaque. Calcium Controlled Helps limit the mineralisation of plaque to tartar. Magnesium Phosphorus Controlled Supports urinary tract health. Target urinary pH Acid: pH 6.2 -6.4 Supports urinary tract health. Ingredients: Chicken: Chicken (40%) and turkey meal, brewers' rice, maize, maize gluten meal, cellulose, animal fat, minerals, digest, soybean oil, taurine, vitamins, trace elements and beta-carotene. With a natural antioxidant (mixed tocopherols). Other dental home care methods are recommended, if possible, e.g. regular tooth brushing. Below are some recent questions we've received regarding Hill's Prescription Diet t/d Dental Care Cat Food, including answers from our team. Hi, had our old cat to the vet last night and the vet said that his teeth were wuite bad with a buid up of plaque. I volunteer at a local pet rescue centre and one of the cats there took these. My cat is 16, wighs 5.7kgs, takes loxicom for arthritis in his back adn also youmove. He has had ctystals in his bladder too and occasionally gets urinary biscuits/meat. Would these be suitable for him? Even a small amount mixed with his food? If not suitable what else could you recommend? Thanks. This food would be ideal for your cat and helping to remove the plaque from his teeth. It is perfectly safe to give in conjunction with Yumove and Loxicom. Protein content is 32% as fed, or 35% on a dry matter basis.